These are just two of the adorable items you'll find in the W.D. 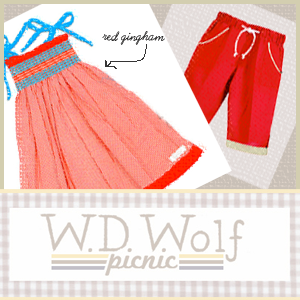 Wolf Picnic Line (left to right are computer sketches of the Alice Dress and the Eddie Shorts). We think they're just perfect for a backyard BBQ or a picnic at the beach (I'm seeing fireworks, American flags & hotdogs on the grill)... More to come soon! Cute!!! Can totally see these at a picnic or BBQ. Thanks, Meagan! Waiting for samples is like… waiting for Christmas morning as a kid!! We are so excited.